Now winter has muscled in, it is time to eat real Dutch comfort food – and that means lots of mashed potato with either a bacon chop, a sausage or a meat ball. Robin Pascoe recommends six classic stamppot recipes. Despite all my years of living in the Netherlands, there is one classic Dutch dish that I still cannot bring myself to eat – the dreaded spinazie a la creme. 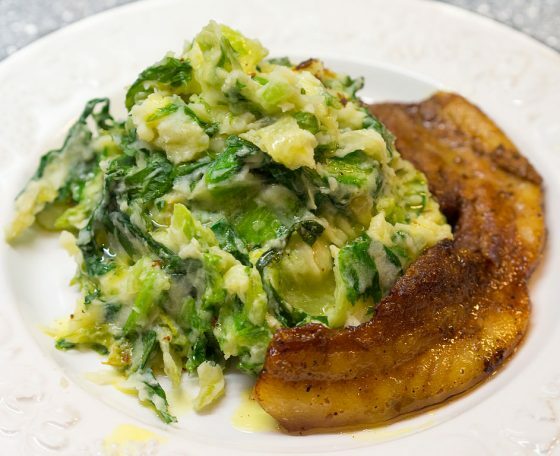 Deep-frozen spinach with some sort of cream added in, served with fish fingers and mashed potato was, at one time, a Dutch tea time staple – and may still be if the television ads are anything to go by. The same goes for the ubiquitous ovenschotel (oven dish involving mince and/or pasta), and chicken with apple sauce. There are, however, some classic Dutch winter warmers, all based around the humble potato which have a lot to recommend them. And a generous amount of fried bacon bits (spekjes) are essential in every one. Absolutely the best among the Dutch mashed meals, hutspot is probably related to the late Middle English hotchpotch – a mutton stew with vegetables – which has now come to mean a confused mixture of unrelated items. Chop up equal quantities of potato, carrot and white onion and boil over a low heat for about 20 minutes. Drain the liquid and mash with a big dollop of butter and splash of milk. Add lots of fried bacon bits and serve with braised beef or a smoked bacon chop. Delicious. I always find this the most complicated stamppot to get the quantities right but it is worth the effort and extremely good for consuming large amounts of green leafy veg at one sitting. The rebirth of curly kale as a super food has helped put boerenkool met worst firmly back in the top of the Dutch culinary tree. You are, as a fully integrated foreigner in the Netherlands, supposed to love it. Boil around a kilo of peeled potatoes in a large pot for 15 minutes. Add around 500 grammes of drained zuurkool (sauerkraut) and cook for a further five minutes. Drain and mash together with salt, pepper, butter and a splash of milk. Add fried bacon bits. Serve with a classic Dutch smoked sausage and plenty of mustard. Some people add apple as well as zuurkool to the mash. It is also extremely good with bacon chops. Stamppot with sprouts is yet another variation on the theme. Again, you need twice as much potato as sprouts. Boil the potatoes for 10 minutes then add the sprouts. Cook till done, then remove some of the sprouts. Mash the rest with butter, milk and bacon bits. Add the rest of the whole sprouts and serve with a bacon chop or a meat ball. Hete bliksem literally translates as hot lightning, but is also slang, I am told, for a wanton woman. This stamppot is made in the classic stamppot manner, cooking equal quantities of potato and apple – half sweet apples and half sour. Mash well, adding butter and bacon bits and serve with bloedworst – blood sausage. The Dutch are very inventive with their stamppots and add all sort of different ingredients, including curry flavourings, other vegetables, sweet potatoes, goat’s cheese, pineapple and even fish. Albert Heijn’s recipe website has 410 variations, if you are feeling like further experimentation.